Police Scotland have been accused of acting as Donald Trump’s private security force after charging a 61-year-old woman for allegedly answering the call of nature amongst the dunes at the would-be US president’s golf resort in Aberdeenshire. Rohan Beyts, an endurance swimmer, mountain climber and former social worker, has been charged under section 47 of the Civic Government Act (Scotland) 1982 for urinating “in such circumstances as to cause, or to be likely to cause, annoyance to any other person”. If convicted, she could be fined up to £500. She said she was visited by police at 10pm on Thursday night after a complaint from the Trump organisation. Police officers told her that Trump staff had photographed her on mobile phones committing the alleged offence late in the afternoon on 11 April. “There was no-one in view when I – and I am not admitting anything – sat down in the dunes which suggests that they were keeping out of sight,” she said. She was accused by the Trump organisation, however, of causing offence. “Offensive behaviour such as this is a matter for the police,” said Trump’s Scottish spokeswoman, Sarah Malone. Beyts said she had never been charged with any offence before. She is an active environmentalist and has protested against Trump’s golf course in the past. She does voluntary work for the John Muir Trust, which protects wild land – including clearing up other people’s wastes. She famously swam the Gulf of Corryvreckan, site of the world’s third largest whirlpool, to raise money for the trust in 2011. When she does have to relieve herself while out walking she follows the Mountaineering Council of Scotland’s advice on “where to go in the great outdoors”, she said. 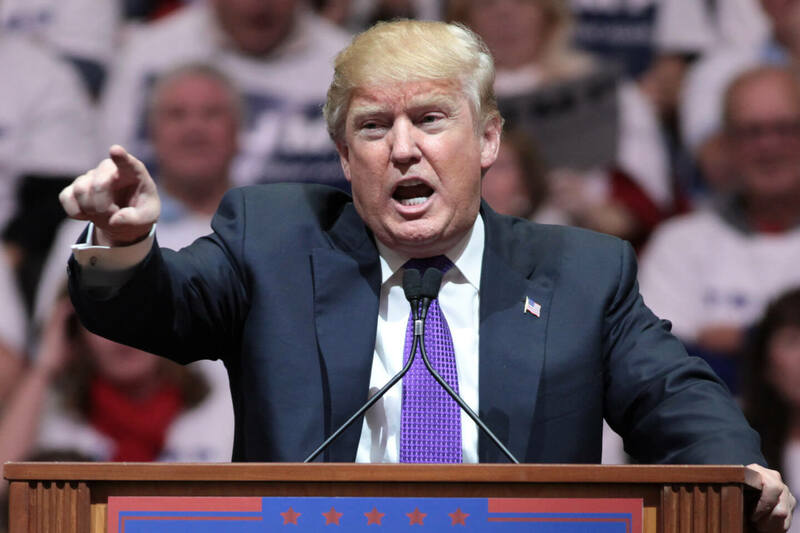 The Scottish Greens accused Trump of “bullying and heavy-handedness”. The party’s justice spokesperson and former police officer, John Finnie, urged Police Scotland to drop the charge. “Few folk will not have had cause to take a comfort break and, so long as appropriate steps are taken to ensure privacy, there should be no issue,” he said. “The police should reflect on their actions. If the matter is reported further then the Fiscal should place the report in the bin and have a word in the lug of the officers involved. Police Scotland confirmed that Beyts had been charged under section 47 of the Civic Government Act (Scotland) 1982. “Police Scotland has a responsibility to investigate any and all reports of criminal activity,” said a police spokeswoman. Read updates on this story here and here. A version of this story was published in the Sunday Herald on 17 April 2016. Cover image thanks to Gage Skidmore, Peoria, AZ, US, Donald Trump, CC BY-SA 2.0. Photo of Rohan Beyts thanks to Rory Syme/John Muir Trust. The nemesis of most walkers – the Golf Course! Anyway, anyone who walks or cycles for more than a few hours is going to need to relieve themselves from time to time, and you cannot always rely on a convenient convenience – sometimes it is hard to find adequate screening from others – when you gotta go, you gotta go, but I always try to be as discrete as possible as Rohan would have been. I deeply resent people thinking they own the countryside – it belongs to all of us, not just Golfers. If I was photographed/videod having a call of nature, I would accuse those people of being perverts and expect the police to make them delete the footage. They were staff filming what appeared to be a anti-social if not criminal act. There is no way they could have known she had a medical condition. I also dislike Donald Trump however I can’t see why this has become a court case. More a case of ‘taking the piss’ if this goes to court: Update? I am sure that a quick look at the bookings on the day in question will prove that nothing wrong was done in front of no people whatsoever……..apart from the three members of staff who were hiding in the bushes to take photos of unsuspecting women. Someone should be charged with taking rude pictures of people. Is it mid-summer’s day for the dunes mass piss-in? Hmm. I suppose a mass piss is in dubious taste? Is it any coincidence that D. Trump’s surname embraces a synonym for arse?